The Office U.S. Vs. 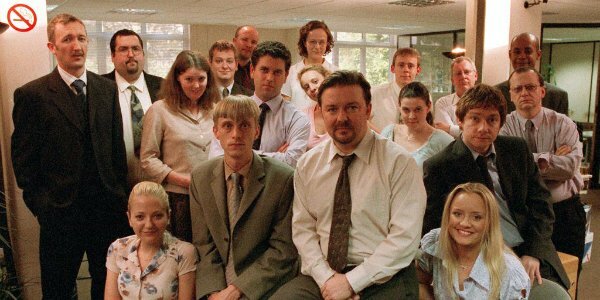 The Office U.K.: Which Comedy Wins Out? Some might argue that comparing art is a fruitless exercise. They'd probably be right. Pitting one work against the other in some kind of quality competition certainly goes against the spirit of any true artistic endeavor. But sitcoms aren't really art and nobody likes fruit. Obviously, I'm kidding. Fruit is healthy as well as delicious. And sitcoms can occasionally be Art with a capital 'A.' Now, with that pretentious bit of rationalizing out of the way, what version of The Office is better? U.K. or U.S.? Is there a correct answer? Again, probably not. But that's not going to stop me from trying to argue one. And, after a look deep inside myself not to mention a look back through both Ricky Gervais and Stephen Merchant's original and Greg Daniels' remake (thanks, Netflix), I'd have to go with the U.S. version of The Office.. It pretty much boils down to one reason, there's just more of it to love. Yes. I'm taking the stance that the British model of limited 'series' (seasons for us) per show, which in turn contain fewer episodes, may provide a better batting average but at the end of the day two hundred and one trumps twelve and one. Why else would we get upset when our favorite shows get cancelled after one, two or three seasons? Don't leave us wanting more, give us what we want! Besides, even the batting average assertion is up for debate because, if one incarnation was so superior to the other, I wouldn't even be having this one-sided conversation in the first place. If you combined the two and made a list of the best installments, would the British rank 1 to 13 with the American 201 bringing up the rear? I don't think so. There's a long list of great episodes in the remake, easily three to four times as many as the original and that's assuming that every one of the Gervais' is above criticism. I'll even go out on that limb and say that The American's lighter tone doesn't just make it more 'accessible' (it still has it's own edge) but also ultimately the funnier and more impressive of the two. Comedy out of positivity is hard. And it's not just that Daniels’ adaptation is easier to watch, but that the laughs are not entirely born out of exploiting the awkward or the taboo. Entirely might be unfair since there's some sweetness in the British series (Tim and Dawn), however, I can say that "The Christmas Special" was one of the most depressing comedies I have ever watched. David Brent (Gervais) gets his happy ending but only after being put through the wringer for over an hour. Or more accurately, seven. Despite having the same setting, adapted story-lines and similar characters, The Offices are two very different series tonally. There's still a significant amount of humor coming from uncomfortable situations on the American show, however, there are as many or more hilarious moments that are also sweet, sincere and fun. It's no surprise that the heir apparent to, well, both, Parks and Recreation - which might be the best sitcom on network TV - comes from the same people, namely Daniels and Michael Schur aka Mose Schrute, who worked on making the U.S. version special for so many years. Too many? Perhaps. But the longevity, as I've been saying, is what has also allowed The Office to grow bigger and better than the original. Not all the episodes are great. The show surely overstayed its welcome, but thankfully no where close to Simpsons levels and there were always great episodes right up until this final year. Season 9 produced a few installments on par with Seasons 2 through 5 as well as adding an interesting twist on mockumentary by bringing the 'crew' into the story. And isn't it a lot harder to craft a couple hundred funny stories than a baker's dozen? Especially since sitcoms aren't meant to be watched once (syndication, DVDs or streaming), it's a big bonus to have a huge catalogue to play and replay. 201 > 13. The most obvious benefit of the longer engagement, as well as the most compelling reason why the adaptation is better than the original, is the extra time to develop the supporting cast and their stories. It's difficult to create that many fleshed out characters in only 13 episodes. Even if you think Brent was better than Michael Scott (Steve Carrell) - he's not, largely because of Carell's performance - or choose Tim and Dawn over Jim and Pam - really tough call - or prefer Gareth to Dwight - the former may have an edge - there's no comparison when it comes to the rest of The Office. There are a lot of laughs from the likes of Angela, Kelly, Oscar, Kevin, Creed, Ryan, Meredith, Phyllis, Stanley and Darryl. And Andy, Erin and Gabe. Oh, and I guess, Toby. Not to mention the many underused characters or long list of great guest stars along the way. I mean, Angela and Dwight's relationship alone makes a convincing case to choose the American version over the British. Again. Not that you should have to choose. But in a desert island scenario, which version are you taking? The Office special two-hour series finale airs Thursday at 8:00 p.m. ET on NBC. It starts with an hour long retrospective before the show wraps with Episode(s) 200/201, "Finale."